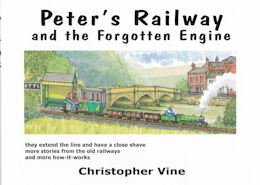 A gentle tale where Peter saves Christmas with a Santa Special train across the farm. Age range 3 to 6 years. Paperback, 32 pages with 12 watercolour pictures. Peter and his Grandpa have built an amazing miniature steam railway between their houses; Woodland Cottage and Crossacres Farm. 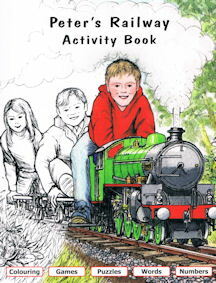 The line even runs to Yockletts Village where Peter goes to school. The locomotive, Fiery Fox, is a wonderful machine. Bright green and very powerful. There have been many adventures on the railway and Peter and Grandpa have spent countless happy hours building it, together with their other projects. The watermill electric generator is especially handy in this Christmas tale! Click here for more items from Christopher Vine.